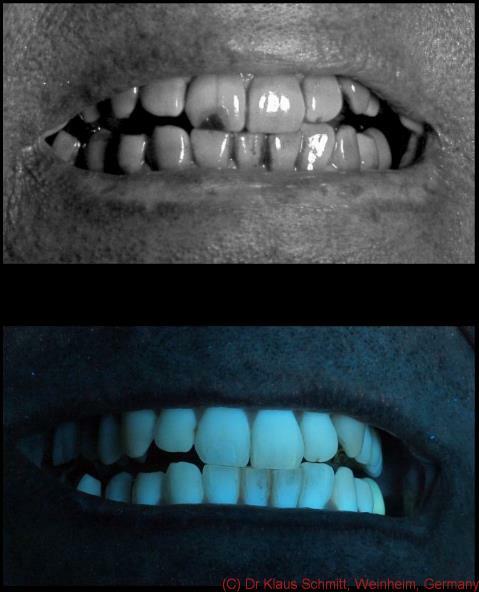 Today about teeth and ultraviolet photography. I found in some older books some contributions of Prof. Woods and esp. Ch. Lunnon about photograping teeth using ultraviolet light. So here some results using my calibrated for UV X35 lens, a Baader 2" U-filter and my newly developed High Power UV flash. The top image clearly shows, repairs, cracks, plaque etc. whereas the second one using a special filtering technique also shows bacteria build up (plaque) as reddish cast and repairs having being done. The small size of the images here do not really show the amount of detail which gets visible using these techniques.